That should be such a simple, insignificant statement of fact, nothing more than just another box on a census form to tick. Today, however, it feels more like a war cry. This is a difficult post for me to write because my emotions are so knotted it's hard to make sense of what I feel. I am ashamed to admit that my first, overwhelming emotion was intense anger - not so much at Jim Adkisson, the man who walked into a Unitarian church in Knoxville and opened fire on innocent people, killing two and injuring eight more. 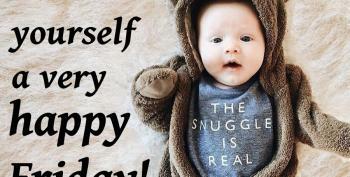 That happens, unfortunately, with all too frequent regularity in America these days, and for a depressingly repetitive litany of reasons - depression, frustration, confused anger and overlooked or ignored mental illness. The Adkisson killings is not an uncommon event these days. What is, however, was his target - Unitarians. Members of a church renown for its pacifism, compassion and tolerance. We welcome anyone - men and women of any colour and nationality, of any religious or ethnic background, or sexuality. We even welcome conservatives. My anger instead is concentrated on those people who callously use such vulnerable people, stirring up their bigotry and discontent, egging them to acts of violence. People like Michelle Malkin, Michael Savage, Bill O'Reilly, and Rush Limbaugh who have made lucrative careers out of liberal-bashing. People who write things like "Liberalism is a Mental Health Disorder", "Let Freedom Ring," and "The O'Reilly Factor," - all literature found in Adkisson's home after the shooting. People like Ann Coulter who advocated attacking liberals with baseball bats. The hate-filled spewage from the right-wing media mavens is and should be held accountable for inciting such acts of violence and murder, those heartless, soulless, conscienceless opportunists who have gleefully participated in encouraging the Adkissons of America to take out their anger and hatred and frustration on liberals. People died. Good people, decent caring loving people, with friends and families. They had names: Linda Kraeger and Greg McKendry, a sixty-one year old woman and a foster father who heroically sacrificed his life to save children and his fellow congregation. They had friends and family and people who loved them and will grieve for their loss. I make my living writing, words are my stock and trade. I have no words adequate enough to express my utter contempt and loathing at this moment for every rabid talk show host and every smarmy pundit who ever espoused the killing or injury of another human being because of his or her political beliefs. If I could, I'd have every single one of them arrested as accessories to murder. The blood on their hands is not metaphorical any longer - it's real. And they know it, if the bizarre backpedalling of the Malkinesque-ilk is to be believed, so desperate to distance themselves from such actual blood and death that they can shamelessly claim Adkisson is really a liberal trying to discredit conservatives. Despicable. The blogosphere is already ripping into that moral sickness that has so pervaded the rightwing that such acts have become not only possible, but excusable - a couple posters on the Free Republic had little sympathy for the dead; what kind of Christian church, after all, not only accepts gays but would even think of putting on a production of ‘Annie'? Grounds enough for mass murder, to that warped mindset. But... I am a Unitarian. And in the wake of the anger is pride. Despite my sadness that people were targeted for their choice of church, I have never before been so proud to be a Unitarian, as well as a liberal. Those liberals the rightwing continue to denigrate as weak-kneed cowards proved to be anything but. McKendry was the first to confront Adkisson, to stop him from going any further into the church, before several men rushed Adkisson after several shots had been fired, his victims already covered in blood. They have names too: A history professor, John Bohstedt, and Jamie Parkey, just ordinary people. But people who still prove the very best in America still exists. ‘Someone grabbed the gun and we just kind of dog-piled him to the floor', Parkey said. His wife, Amy, described Adkisson - not as a villain, not as an evil man, not with hatred - but as ‘a man who was hurt in the world and feeling nothing was going his way. He turned the gun on people who were mostly likely to treat him lovingly and compassionately and be the ones to help someone in that situation.' I wept when I read those words. Because... I am a Unitarian. I was born and raised in a faith that teaches tolerance and acceptance and forgiveness. At the moment, it's quite difficult for me to live up to the tenets of my faith, but I've lived my entire life following them, if sometimes imperfectly. Hate is easy. Blame and criticism and anger and revenge are easy. It's what those talk show hosts and political pundits and politicians on the right have exploited to cultivate their poisonous atmosphere - and I don't want to be anything like them. So I will choose the hard way. I will try to forgive the Adkissons of the world who have been manipulated and conned into violence. I don't think I'm quite ready yet to forgive the Coulters and the O'Reillys and the Malkins and the Limbaughs of this world just yet... but I will try to work on not hating them quite as much as I know they hate me. It's a step. Maybe tomorrow I can do better. Today Our Kid forwarded me an email from Cilla Raughley, the UUA's District Executive, sent out to congregational ministers, religious educators, and board presidents. In it she pleaded for calm, patience and wisdom. And asked that Unitarians might want to wear UU T-shirts or jewelry to show their solidarity with those who share our religious values, whether they are Unitarians or not. 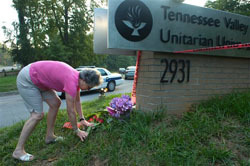 She also asked that anyone wishing to send a remembrance card on behalf of Greg McKendry and his widow, Barbara, could do so: Tennessee Valley UU Church, 2931 Kingston Pike, Knoxville, TN 37919-4624, as well as to the neighbouring Westside Unitarian Fellowship, 616 Fretz Road, Knoxville, TN 37919-1604, which is where Linda Kraeger would have normally been on a Sunday morning. And if a reminder was ever needed why I am and will always be a Unitarian, it is that during the candlelight service held in memory of those who died, a few of the children who had been performing in the cast of ‘Annie' broke into song. They sang ‘Tomorrow', in a heart-wrenching reminder that the sun will come out tomorrow.